Tourists who spend more than a day or two exploring any Moroccan medina soon notice baking being carried through the streets. It might be the flat, circular loaves of bread they’ve surely eaten at breakfast. 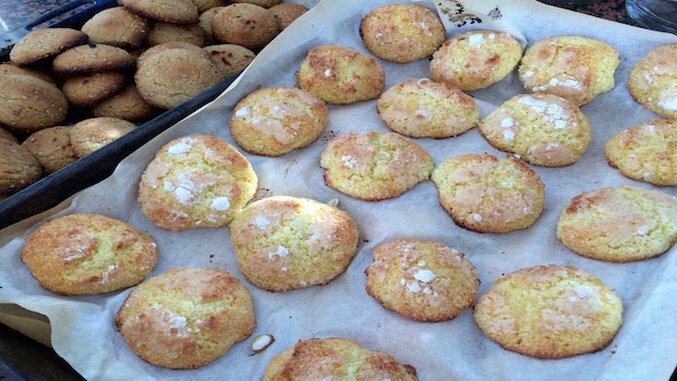 It might be the coconut cookies, resembling macaroons, that many riads use to welcome guests to Morocco, accompanied by glasses of hot, sugary mint tea. Even if they haven’t seen the trays, visitors notice the sweet scent of fresh baking. Most tourists assume that a bakery is doing a booming business supplying nearby restaurants and hotels. Until the observant among them notices that trays of raw dough are also carried through the twisting medina streets. Medinas are the oldest sections of North African cities. Surrounded by high walls, many medinas are purposely labyrinthine, designed to slow down ancient invaders who breached the walls. The twisting streets and alleys are narrow, seldom wide enough for cars. The 1200-year­-old Fez medina is supposedly the world’s largest car-­free urban area. carry goods (and tourists’ suitcases) through the passageways. Men and women wear hooded djellabas (though most certainly with a cellphone in their pocket). Many houses don’t have running water, so residents draw cooking water from fountains and visit the hammam to bathe. Few homes ­­or even buildings that have been renovated into riad or dar hotels ­­have ovens. Even if they do, they’re rarely used. Instead, home cooks and restaurant pastry chefs send their baking to the communal oven, the faraan. With sticks of olive wood piled outside, family-­owned faraans have deep brick-­lined ovens within. The expert baker puts his neighbors’ dough onto a long wooden paddle and then slides it into the oven. He knows which part of the oven is best for sesame cookies and which is best for round khubz bread. He keeps track of which baking belongs to which household, even without the identifying marks some cooks put on their dough. saving fuel, whether it be propane or wood. And it saves time. difficult than baking at home. Not in community­-minded Morocco. announcement by serving a celebratory b’stilla pigeon pie. The faraan is an equalizer ­­— everyone in the medina uses it to bake their bread and fish tagine, though the quality of ingredients may differ. As Mustapha explains, while neighbors may gossip about a man skipping prayer or a woman wearing skirts deemed too short, without question their household’s baking will be delivered to the faraan just like any other. He’s incredulous that I would think otherwise. Visitors to Morocco can get a taste of the communal oven experience by taking a baking class. Dar Zerhoune, an upscale guesthouse in the holy city of Moulay Idriss, an hour from Fez, offers a personalized one. Passing down techniques learned from her mother and grandmother, guesthouse manager and baking teacher Hajiba Dahik models rolling sesame cookies into precise balls and teaches me the desired stickiness for each stage of bread dough. When our six trays are full of sweets and savories, Dar Zerhoune owner Rose Button walks me down to the communal oven. Neighbours peer at us with interest. At the faraan, the baker chats with Rose in Arabic and points at the sesame cookies. Rose replies, gesturing at me. I’m convinced it’s because he can tell the cookies’ shape is obviously not Hajiba’s perfect work, but perhaps she’s just explaining the reason we have so many trays at once. Later that afternoon, we feast on our creations atop Dar Zerhoune’s roof terrace. Dribbling local honey onto the warm bread, I gaze across Moulay Idriss’ rooftops over to Volubilis, the UNESCO Roman ruins next door. The communal ovens used 2,000 years ago there are almost identical to those in every medina of modern Morocco.